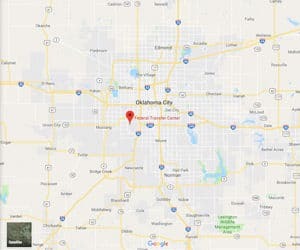 Location: FTC Oklahoma City is located 3 miles west of I-44 and 4 miles south of I-40. Background: FTC Oklahoma City was opened in 1995. It is the Federal Bureau of Prisons’ transfer hub for male and female inmates. It serves as the main hub of the Justice Prisoner and Alien Transportation System, popularly known as Con Air. A cadre of low-security inmates are assigned to FTC Oklahoma City to perform food service and maintenance duties. Author of the TV show Orange is the New Black stated that circa 2005 the women’s section was “spotlessly clean” and “subdued”. Housing: Inmates are housed in one and two-tier housing units which consist of cells with bunk beds inside them. Health Services: Medical services are provided by FTC Oklahoma City medical staff and community consultants. All new inmates receive a preventive health screening and dental screening which screens for viral hepatitis, HIV, TB, colon cancer, diabetes, and cholesterol. Dental sick call is for emergency care only. To obtain routine dental treatment inmates must submit an inmate request to staff to the Dental Department. Medications are also provided. Medical services are available to inmates on a 24-hour basis through routine medical programs and urgent emergency care. Psychology Services: Psychology staff provide a full range of psychological services on an as-needed basis. Brief clinical assessments are completed on all newly committed cadre inmates. Brief counseling is available as well as specialty programs such as stress management, rational thinking, and dealing with grief, which are periodically offered and available to cadre inmates. Psychologists are available 24 hours a day, year-round to respond to emergency mental health concerns. Residential Drug Abuse Program (RDAP): FTC Oklahoma City does not house a Residential Drug Abuse Program (RDAP), however it does offer a Drug Education Class and the Non-Residential Drug Abuse Program (NR-DAP). Education Services: FTC Oklahoma City provides literacy, GED, and English-as-a-Second Language (ESL) programs. Adult Continuing Education (ACE) classes and Release Preparation Program classes are also available. Release Preparation Classes focus on interview skills, resume writing, cultural diversity, locating jobs, and additional classes. Inmates can find notices of additional education classes on the cadre unit bulletin board. High school diplomas and post-secondary programs are available through paid correspondence programs. Advanced Occupational Education: FTC Oklahoma City does not offer any advanced occupational education programs. Vocational Training: FTC Oklahoma City does not offer any vocational training programs. Apprenticeship: FTC Oklahoma City does not offer any apprenticeship programs. Library Services: An Electronic Law Library provides inmates with access to law library materials. Typewriters are available in the cadre unit for legal document preparation. A leisure library offers inmates fiction and nonfiction books, magazines, and newspapers. UNICOR: FTC Oklahoma City does not house a UNICOR facility. Commissary: Inmates can spend up to $360.00 per month and may shop at the commissary once per week with an additional short line for stamps, hygiene and special purchase orders only. Commissary items include beverages, food, clothing, electronics, and others. Transferring inmates do not have access to commissary shopping while at FTC Oklahoma City. Recreation Services: There are several hobbycraft programs offered to FTC Oklahoma City cadre inmates. Cadre inmates may also participate in structured fitness programs and activities such as basketball, handball, unit walking, and utilizing fitness equipment. Fitness programming is also part of the Release Preparation Program. A bulletin board is located in the cadre unit to keep inmates informed of recreation opportunities.